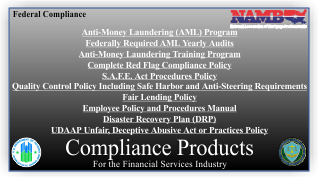 We offer a range of compliance solutions including Anti-Money Laundering (AML) Program; F.A.C.T.act Red Flag Rule; Gramm, Leach, Bliley Internal Security Policies; Quality Control Compliance and S.A.F.E. Act Compliance. Contact us today for a review of all your needs. Purchase both policies together and save $50! $250. for S.A.F.E. Act Procedures Policy AND Quality Control Policy Together!